New Gundam Breaker could be on the way to PC. 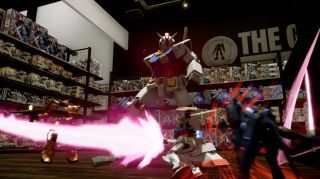 While a PC version of the game has yet to be confirmed, a ResetEra member noticed that The Brazil Advisory Rating Board had listed New Gundam Breaker as available on PC, along with the PlayStation 4 version already confirmed by publisher Bandai Namco. I know what you're thinking; advisory boards aren't always right, and it's possible this is just a mistake. But given Bandai Namco Europe recently circulated a newsletter with a PC logo next to the PlayStation 4 one, it's seems more likely than ever that the rumours might be true. In New Gundam Breaker—which is slated to release later this year—you'll get to break, build and battle to build the Gunpla of your dreams, collecting enemy weapons and armour to fashion your ideal set-up, kind of like an Anime LEGO. For more, check out Bandai's latest PlayStation 4 trailer right here.